When I was a young lad I was convinced that there was a small creature that resided under my bed, waiting for me to retire for the day so that it could leap out and attack my ankles. I would take a run up and launch myself onto the mattress just so I didn’t give the monster any chance to pounce. I’m sure that I’m not alone in having had an imaginary foe or friend as a child, as all kids’ imaginations seem to be able to create a fantasy out of the mundane, for better or for worse. Developers We Are Fuzzy have tapped directly into this youthful creativity with their twin-stick shooter cross base-building defence title, Sleep Tight. Though there are no attempts to reinvent the wheel to be found, charm and simplistic fun are abundant, making for an enjoyable venture. Thanks to Sleep Tight you are given the opportunity to take some revenge out on those make-believe bastards in the form of wave-based defence action. The setup is simple, you (a small child) must fortify and defend your room night after night against an ever-growing number of dreamt up monsters that become faster and stronger as time progresses. Similar to games such as Tetris, Sleep Tight forgoes a campaign or a multiplayer offering, rather focusing on high-score chasing, leader-board climbing, and ongoing gameplay that has no reachable end, instead challenging the player to see how long they can hold off their inevitable demise. There are three types of enemies, standard grunts, fast spider-like dashers and heavies. Though there are a small number of enemy types, their attributes change depending on their colour, some being fast, others being strong with a larger health pool. Regardless of type, all of the creatures seem to have stepped straight out of a Monsters Inc. as they are endearing and cartoonish, exactly what you would expect a child to envision. Each of them act in the same manner – make a beeline for you and knock down anything in their path. Though I would have liked to see a little bit more variety from the enemies, such as a type that can climb fortifications perhaps, the frantic nature of each night masks the shortcomings in this department pretty well. You start with only one playable character unlocked, Joe, who is equipped solely with his trusty dart gun. The first night of each session has you gunning down nasties while running around your bedroom (the playable area) trying not to get hit by the monsters. A timer in the top left corner of the screen signifies how long you have until daybreak, where you will be free from being pursued and are given time to prepare for the next night of fighting. In order to prepare you need to gain and spend two types of currency at four different stations set up in each corner of your room. The first, Suns, are awarded to you upon surviving a night. You will always be given eight Suns regardless if you kicked arse or had your arse kicked. These bad boys can be spent at your bed to gain health or purchase a buff, at your toybox to restock on ammo or buy a new weapon, or at your toolbox to buy a wall or turret to help defend yourself. The second currency, Stars, are dropped by every downed enemy during the night and are used in conjunction with Suns at your desk to research and unlock better fortifications, skills and buffs. You are required to spend all of your Suns before you can progress to the next night, meaning you can’t horde them in the early levels to help you later on. This system, though simple in design, is fairly satisfying and provides enough depth to keep each playthrough interesting and challenging as there are many ways to approach your defence. You can decide to embrace buffs and turn yourself into a damage dealing demon that speeds around the room, or you can focus on upgrading walls and turrets and allow your creations to do the work for you. There are plenty of combinations to attempt, and you will need to play about with a few before you find what works best for your play style. Unlike many twin-stick shooters, there wasn’t an option or upgrade that allowed for any kind of laser sight for your weapon and, being a particularly terrible aim, that would have been more than welcome in my eyes. I personally enjoyed bunkering down with a number of walls, turrets and a fast firing weapon and watching the darts fly, running around is for chumps you know. Once you hit the tenth night you will be greeted by a Blood Moon. This is made obvious by the entire room being lit with a crimson light that makes the enemies faster and stronger, making for an extra challenge that might need an altered approach. These appear once every ten nights, so it pays to keep track of what eve you are on. Overall it doesn’t start hitting the fan until around the twentieth night, then you are hit with a fairly sharp difficulty spike that is a tad jarring. A more gradual climb would perhaps make the whole experience more enjoyable, but once you know what to expect in subsequent games, you learn to prepare accordingly. Joe isn’t the only kid that is plagued with visions of beasts, there are a total of twelve different characters to unlock, each with their own distinct look, voice lines and advantages. Brooke for instance, a super edgy punk girl, starts each game with a Spitfire, a fast firing dart gun that makes the beginning few nights a breeze. Dexter on the other hand, a comic-loving book worm, can buy buffs at a discounted rate. 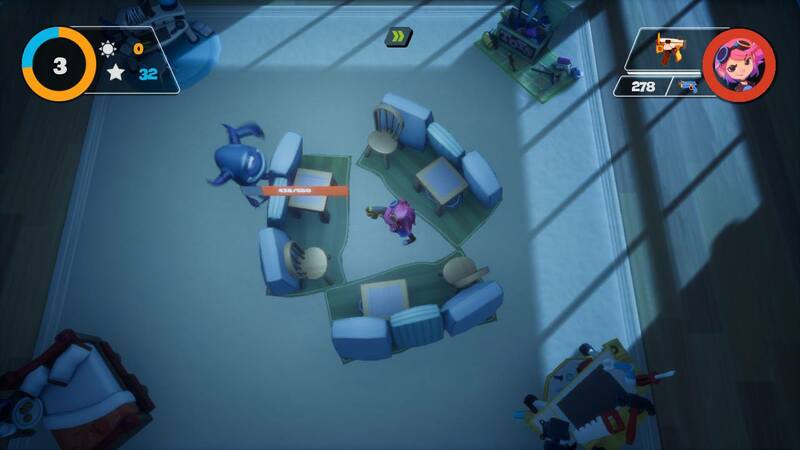 Each character adds a new spin on the game and how you approach it, but more than that, each character is unlocked by meeting special requirement during gameplay. These can be as simple as surviving a certain number of nights, or as specific as surviving eight nights without firing a single dart. This type of unlockable cultivates new ways to play which adds replay-ability. Every character shouts out a few quick lines of dialogue while fighting and while I appreciate some of the pop-culture references made within these, they do get old real fast – they are kids remember, so many of these lines are nonsensical or just plain irritating. Above all else, Sleep Tight shines brightest while leaning on its charming personality. All of the walls that you erect to keep the monsters away are constructed from chairs, tables and pillows, with the most advanced wall being a couch with lights draped over it. The weapons are a range of super-soakers and off-brand Nerf guns and the entire game is set within a kid’s bedroom. If that doesn’t at least make you crack a smile then maybe check your pulse. The soundtrack is also a perfect fit for the tone of the game, being whimsical and light without ever being sickeningly sweet or annoying. The game features a high score section that is entirely offline, promoting that you boast to your friends face to face rather than have your heart broken by seeing the ludicrously massive scores from people around the globe. This game is a perfect fit for the Switch. It is fun and easy to jump into, yet simple enough to put down until you are able to return to it without fear of losing your groove with a similar, addictive draw to play ‘just one more night’ in the same vein as Stardew Valley. 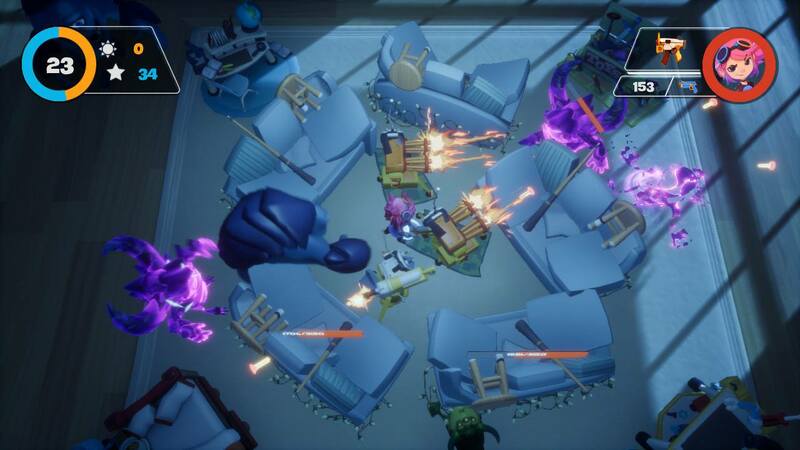 Though it would have been nice to see an extra dash of variety in the way of extra rooms of the house to play in or added enemy types, the $20 you spend on Sleep Tight will be worth it for the style and charm that it exudes alone. So if you are after some quick, pick-up-and-play gameplay, or you simply want some revenge on the ghouls that lived under your bed as a kid, then Sleep Tight is certainly worth your time. A PlayStation fanboy through and through, Adam has an undying love for all things that come from Sony, the only thing he asks for in return is the ability to fix the spelling mistake he has in his PSN name.